Beautiful Art Deco whitewashed villa with contemporary Provençal interiors full of light and space a stone's throw from the sandy Salis Beach in Cap d'Antibes. The property features 5 individually styled suites all air-conditioned, a large living area in the villa and large terrace with partial sea view and view of the lighthouse in Cap d'Antibes as well as a heated swimming pool with small waterfall, terraces, sun loungers and sitting areas. Three 100 year old palm trees are in the pretty grounds as well as a rose garden and a pond with oriental fish and small waterfall. There is parking for up to four cars, an electric gate and side gate with video entry. WiFi facility throughout the property. Sea view room – king size bed, small balcony with sea view and view of the lighthouse in Cap d’Antibes, marble pillared bath with shower, double wash basin in slate and wood. Swimming pool room – king size bed, view of lighthouse in Cap d’Antibes, bath and shower, washbasins in slate and wood. Other Property Features: Living room – 100 m2 light open living space featuring many entertainment areas, living/lounge area with sofa and large chairs, large flat screen TV and fireplace. This is followed by an open area with bar set up with three wine caves and long table and chairs, then a wide conservatory style area leading through to the kitchen and the large terrace with sea view. Fully equipped kitchen leading onto a pantry for storage/washing/laundry area, etc. Tourist Attractions: Villa Val des Roses is very well placed to take advantage of the multitude of activities on the Cote d'Azur. Antibes has its charming old town, Provençal market, artisan shops, a wide range of restaurants and bars, beaches and the largest private port in Europe. The Picasso Museum, Peynet Museum and Museum of Archaeology are all close by as well as Marineland. Cap d'Antibes has an array of public and private beaches including the famous Plage de la Garoupe with nice beach restaurants. Juan les Pins has its Jazz Festival every July and is known for its sandy beaches and lively restaurants, bars and nightclubs. Easily reached are: Cannes with its famous Film Festival in May, private beaches and luxury boutiques; Nice with its beautiful old Italian style town, flower and antiques market, art galleries, opera house and night-life; Monaco for the Grand Prix in May, the palace, luxury boutiques and hotels; and St Paul de Vence with its art galleries and restaurants. All bathrooms are en suite, individually designed, featuring double washbasins in slate and wood. There is ground floor suite with easy access. We had a week here in May with all our family 11 of us including 3 children under the age of 5 - so we rented the whole property - the villa is very spacious and the outside seating is lovely for the warm evenings. The pool and fishpond are fully gated which meant it was very safe for the children - the pool is heated which at the time was very useful as the sea proved to be a bit cold. The position of the villa is ideal for the beaches and walking to the old town . Thank you for your great review & hope to welcoming you and your lovely family again next year, Frederik. 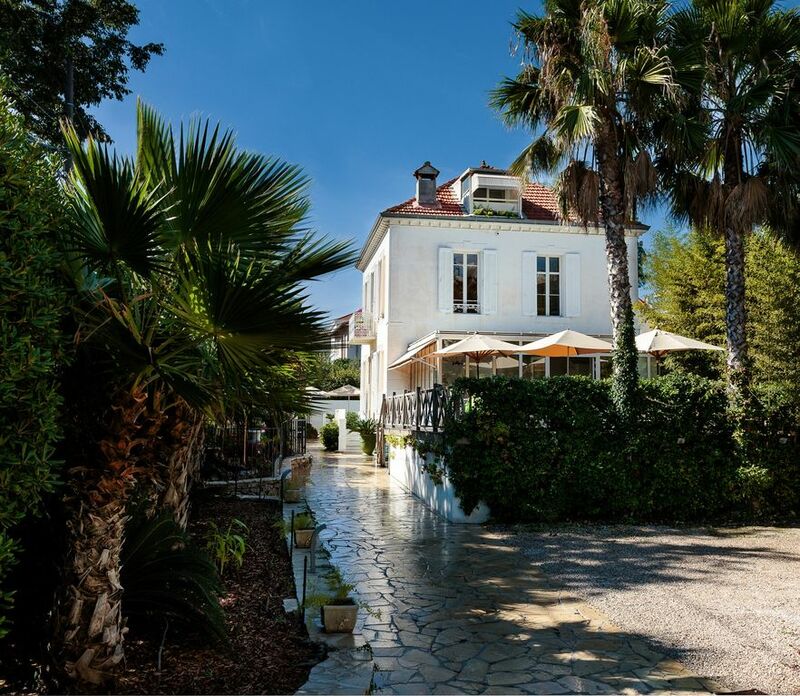 Villa Val des Roses is in an excellent location 50 m from the Salis sandy beach of Cap d’Antibes and 10 min walk into the Old Town of Antibes with its Provençal market, Picasso Museum, artisan shops, galleries, restaurants and bars. It is also a 15 min walk to Juan les Pins with its beaches, restaurants, bars, nightclubs and Casino. Please note that rates are subject to change. Bedlinen, towels, water, gas and electricity and cleaning are an additional charge. Bedlinen can be ordered The cleaning charge is 300 Euro for the end of the stay cleaning Water, gas & electricity cost all together 20 Euro/day Minimum one month rental June to September Minimum one week rental all other times Rentals are from Saturday to Saturday check-in from 15:00 and check-out at 10:00 Children of all ages are welcome Long term rentals may be considered Please note this is a non-smoking property. Booking conditions and terms To confirm a booking, a deposit of 25% of the total rental price is payable immediately. Six weeks prior to the rental the remaining 75% charge is payable along with a 1600 Euro damage deposit. The damage deposit will be returned after the rental should there be no damage and after gas and electricity charges for the rental period have been taken off. All payments are required by bank transfer and in Euro. Cancellation Policy In the event of cancellation at any time prior to six weeks before the rental the 25 % deposit will not be refunded. In the event of cancellation less then eight weeks in advance no refund will be given on the full payment. The damage deposit will be returned. We strongly recommend that you take out travel insurance against cancellation due to unforeseen circumstances and any incidents during your stay.